The Priestmartyr Phocas was born in the city of Sinope. From youth he led a virtuous Christian life, and in his adult years he was elevated to bishop of Sinope. Sainted Phocas converted many pagans to faith in Christ. At the time of a persecution against Christians under the emperor Trajan (98-117), the governor demanded the saint to renounce Christ. After fierce torture they closed Saint Phocas into an hot bath, where he died a martyr's death in the year 117. 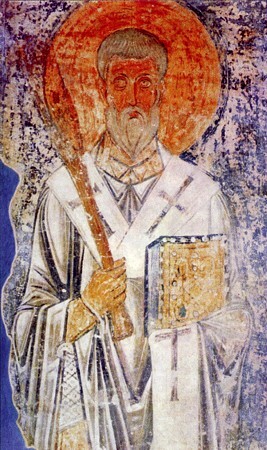 In the year 404 the relics of the saint were transferred to Constantinople (Commemoration of the Transfer of Relics is 22 July). The Priestmartyr Phocas is especially venerated as a defender against fires, but also as giving aid to the drowning.